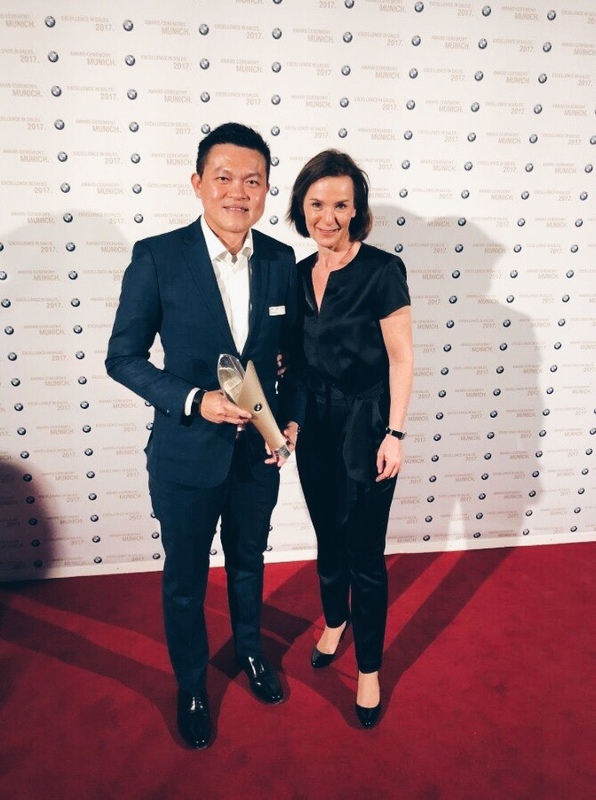 (From Left) The Managing director of Auto Bavaria, Jeffrey Gan and Hildegard Wortmann, the Senior Vice President (Asia Pacific) of BMW Group at the Award Ceremony held at BMW Group Classic in Munich. Kuala Lumpur, 2 April 2018 – Auto Bavaria, the country’s longest serving and largest authorised BMW dealership group in Malaysia was recently awarded the Manager of the Year Award for the Asia Pacific region during the recent BMW Excellence in Sales Awards 2017 held in Munich, Germany. The award recognises the hard work and dedication of the Auto Bavaria team which achieved outstanding performance across all key areas of the business as measured against their peers, including sales, customer orientation, aftersales, sales data, employee retention as well as motivation. Auto Bavaria was one of only 41 top dealers at the BMW Excellence in Sales 2017 awards ceremony. The award was presented by Pieter Nota, BMW AG management board member responsible for Sales and Brand BMW at an exclusive awards ceremony held at the BMW Group Classic in Munich, Germany. Established in 1988, Auto Bavaria, a division of Sime Darby Auto Bavaria Sdn Bhd, is the biggest retail and service organisation for BMW, MINI and Motorrad in Malaysia. Over the years, we have successfully built BMW into one of the most desirable luxury automotive brands in the country. Today, Auto Bavaria's nationwide network infrastructure comprises six branches, namely Glenmarie, Sungai Besi, Balakong, Kuala Lumpur, Penang and Johor Bahru. Auto Bavaria Glenmarie and Penang also houses the BMW Motorrad and MINI showroom. In addition, our BMW Premium Selection centre is in Glenmarie and Kuala Lumpur. Every Auto Bavaria branch is staffed with passionate professionals dedicated to providing world-class sales and aftersales service that exceed expectations. In benchmarking ourselves against the best BMW dealers in the world, we make customer satisfaction the top priority at Auto Bavaria.We record possibly the highest man-hours in training annually in the local automotive industry to keep our staff on top of the latest innovations and technologies and constantly review processes to improve efficiency.At Auto Bavaria, we are committed to making your BMW experience extend beyond your purchase.